A few days ago, I received my very first Contrary Polishes ever and I must admit that the minute I looked at those pretty bottles, I was in love. Today I have 3 of them to share with you, all from recent collections : Bonfire, Santorini and Anna Maria. Bonfire is a deep orange-red packed with different sizes of gold and red shimmer. 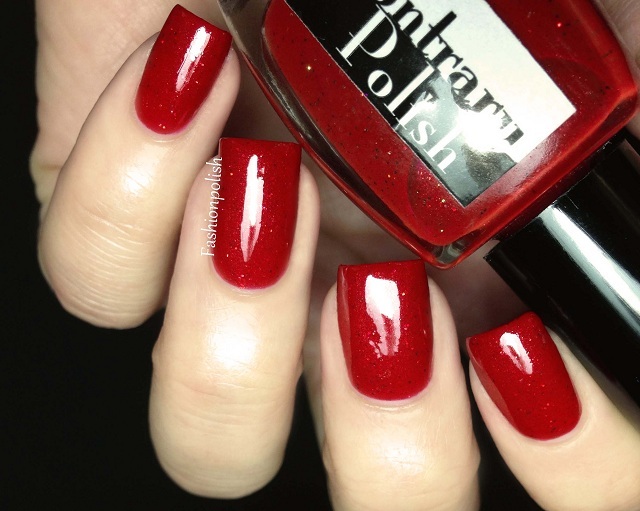 I absolutely love this kind of red, the base is rich and the shimmer complex and not lost on the nails. Formula was also fantastic, even and pigmented, almost a one coater. I used 2 coats plus topcoat for full opacity. 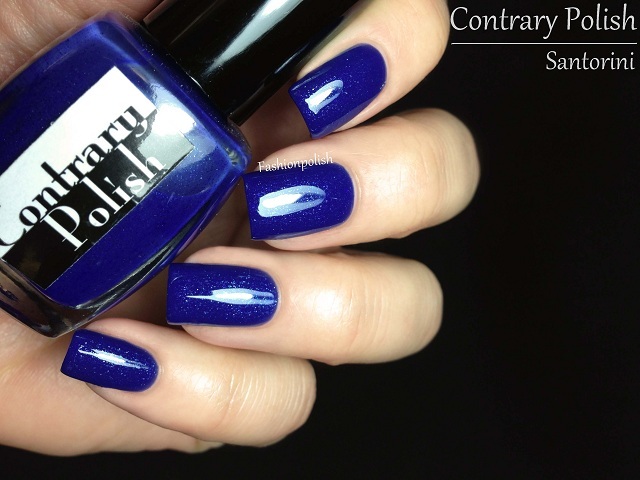 Santorini is a bright royal blue with a blue and silver shimmer running through. The base/shimmer combination isn't the most original but it's amazing nonetheless. Formula was also really good, a bit less opaque than Bonfire but still perfectly opaque in 2 coats. Anna Maria is the most original of the three : muted grey teal with different sizes of gold, green and copper shimmer, amazing! Formula was similar to Santorini, even and opaque in 2 coats. For the first experience with Contrary Polish, I am really impressed! The shimmers are gorgeous and the formula perfect. If you've never tried indie brands because you're not into glitters, these are for you! I love Santorini but Anna Maria's my favorite! It's the most unique of the 3 shades in my opinion! Lovely - I too am a sucker for golden shimmer in a really nice warm red! And Santorini does remind me of the beautiful ocean waters around the Aegean Sea! Anna Maria is beautiful!!! Your pics are perfect, as usual! Santorini is outstanding. ALL beautiful! They look perfect on you!!! 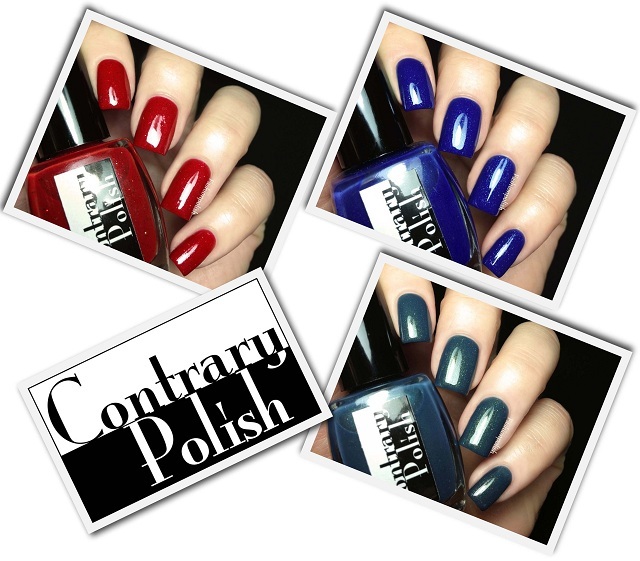 I also own a couple of Contrary Polish and absolutely love them. I found it so refreshing that Contrary Polish stepped beyond glitters. I also own Desert Fruit by them. And with this polish not only the color but also the formula is sheer perfection!!! Anna Maria is really pretty! The teal Anna Maria is absolutely unique and gorgeous, that shimmer is just to die for. I love Santorini as well, it does remind me a little bit of Orly Royal Navy (which was a bit of a disappointment for me), but this one here is much more vibrant and the shimmer just absolutely stunning. Really droolworthy swatches, as always!